The sun was very high on the sky on that day. Light was too harsh for photography. Summer was trying push away those few days we call here as winter. My daughter wanted to play and asked me to come under the shade of this huge mango tree (Mangifera indica). It was a nice respite from the afternoon heat. As we went closer to the tree we saw two different barbets on different branches. I initially thought this one was a Juvenile Coppersmith Barbet (Megalaima haemacephala) but on closer inspection I found out it is White-cheeked Barbet (Megalaima viridis). Barbets are always heard in India, but seldom seen as they camouflage well under the leaves. I had my trusty Canon EF 300mm f/4.0 L IS USM on not so trusty Canon EOS 7D. I would have loved to have Canon EOS 5D mark II which would have coped with harsh contrast better than Canon EOS 7D. But the 1.6x crop factor of the Canon EOS 7D was the bonus. Even tough I was using 300 mm lens, because of this crop factor I was really shooting with effective focal length of 480mm in 35mm terms. This had advantage in the “shoot the bird” territory. Also the superior focusing ability of 7d, I was able to capture these birds sharply. Afternoon sunlight produces dark shadows and bright highlights thus producing a contrasty situation. Getting a right exposure without having these distracting elements inside the picture is many time impossible. I have seen many photographers who hate to go out when it is cloudy, during early morning or late evening. They are under an impression that you need to have bright light for good photograph. But the truth is just the opposite. They don’t know what they are really missing. So called “golden hours” of morning and evening are the best times of the day when the light is directional and soft thus creating much pleasing texture as well as depth which transforms your ordinary shot into a great picture. Cloudy day is also best time to shoot as cloud acts as large soft-box diffusing light. To lessen the effect of contrast of the afternoon harsh sun I chose a vantage point which had much lesser sunshine. Even then the branch where the bird was sitting was unevenly lit and caused lot of distraction. The White-cheeked Barbet or Small Green Barbet (Megalaima viridis) is a species of barbet found in southern India. It is very similar to the more widespread Brown-headed Barbet (or Large Green Barbet) (Megalaima zeylanica) but this species has a distinctive supercilium and a broad white cheek stripe below the eye and is endemic to the forest areas of the Western Ghats and adjoining hills. Like all other Asian barbets they are mainly frugivorous although they may sometimes eat insects and they use their bills to excavate nest cavities in trees. Like many other barbets these are green and sit upright and still on a tree perch making them difficult to spot. During the breeding season at the start of summer their calls are loud and constant. The call, a monotonous Kot-roo … Kotroo... starting with an explosive trrr is not easily differentiated from that of the Brown-headed Barbet. During hot afternoons, they may also utter a single note wut not unlike the call of Collared Scops Owl (Otus lettia) or Coppersmith Barbet(Megalaima haemacephala). The Coppersmith Barbet, Crimson-breasted Barbet or Coppersmith (Megalaima haemacephala), is a bird with crimson forehead and throat which is best known for its metronomic call that has been likened to a coppersmith striking metal with a hammer. It is a resident found in South Asia and parts of Southeast Asia. They are mainly fruit eating but will take insects. As you can see this barbet had its mouth fully stuffed with seeds probably it was carrying to its nest. They are frugivorous like rest of barbets. This species of barbet is found to overlap in range with larger barbets in most of South Asia. In the Western Ghats, it also overlaps with the Malabar Barbet (Megalaima malabarica) which has a very similar size and a more rapid call. The red forehead, yellow eye-ring and throat patch with streaked underside and green upperparts, it is fairly distinctive. Juveniles are duller and lack the red patches. The sexes are alike. This is the Megalaima haemacephala indica subspecies (Latham, 1790) that is found in the Indian Subcontinent from northeastern Pakistan and extends into Sri Lanka and Vietnam. The Sri Lankan form has more black on the face, more red on the breast and darker streaks on the underside. Keeps solitary, pairs, or small groups; larger parties occasionally on abundantly fruiting Ficus trees. Fond of sunning themselves in the morning on bare top branches of tall trees, often flitting about to sit next to each other. The flight is straight, with rapid flaps.They compete with other cavity nesting birds and frugivores. 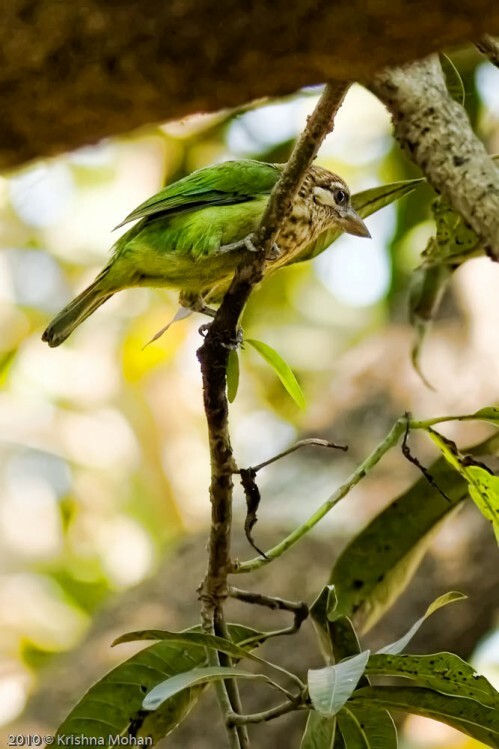 Blue-throated Barbet (Megalaima asiatica) have been noted to evict them from their nest holes, while Red-vented Bulbuls (Pycnonotus cafer) have been seen to indulge in kleptoparasitism, pirating berries that the males bring to the female at the nest. The nest holes are also used for roosting and some birds roost alone in cavities and these often roost during part of the day. Immatures will roost with the parents but often return to roost early so as not to be prevented by the parents from entering the roost cavity. The call is a loud rather metallic tuk…tuk…tuk, reminiscent of a copper sheet being beaten, giving the bird its name. Repeated monotonously for long periods, starting with a subdued tuk and building up to an even volume and tempo, the latter varying from 1.5 to 2 per second. The beak remains shut during each call – a patch of bare skin on both sides of the throat inflates and collapses with each tuk like a rubber bulb, with much body and tail shaking. Not very vocal in cold weather – a spell of rain or cold immediately silences them, but it is one of India’s most familiar sounds in the hot season. EXIF info - Aperture : ƒ/4.5 | Camera : Canon EOS 7D | Taken : 24 January, 2010 | Flash fired : no | Focal length : 300mm | ISO : 1600 | Location : 12° 55′ 19.761239991788″ N 74° 51′ 57.39768019884″ E | Shutter speed : 1/500s | Images and content Copyright © Krishna Mohan. Please contact me to purchase prints or for image publication license. Why is 1.6 crop factor a bonus? You are a very learned man! I wish I also took time to study wildlife. ah..! so its almost same. but for birds 7D is quick enuff. Not bad! very good pictures! the accompanying explanation is also great! Thanks for posting this inspiring blog. Visit my very own! 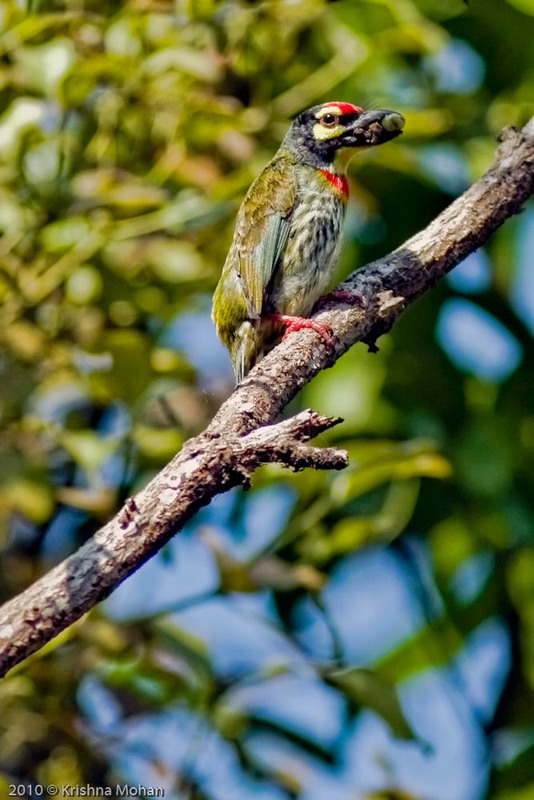 Wonderfully informative write up on the barbets! The coppersmith and white-cheeked barbets visit the trees outside my house regularly and I wondered if competition between the two resulted in a variation of their visiting times. Tamron SP 150-600mm f/5-6.3 Di VC USD Lens First impression.